Happy St. Patrick’s Day tomorrow! Sorry we aren’t sharing something green, but we’re sure you’ll feel lucky once you try this Grilled Pineapple Sundae! We recommend you invited over some family or friends for a great tex-mex meal featuring fajitas, mexican rice with cotija cheese, beans, chips and salsa and the perfect finish . 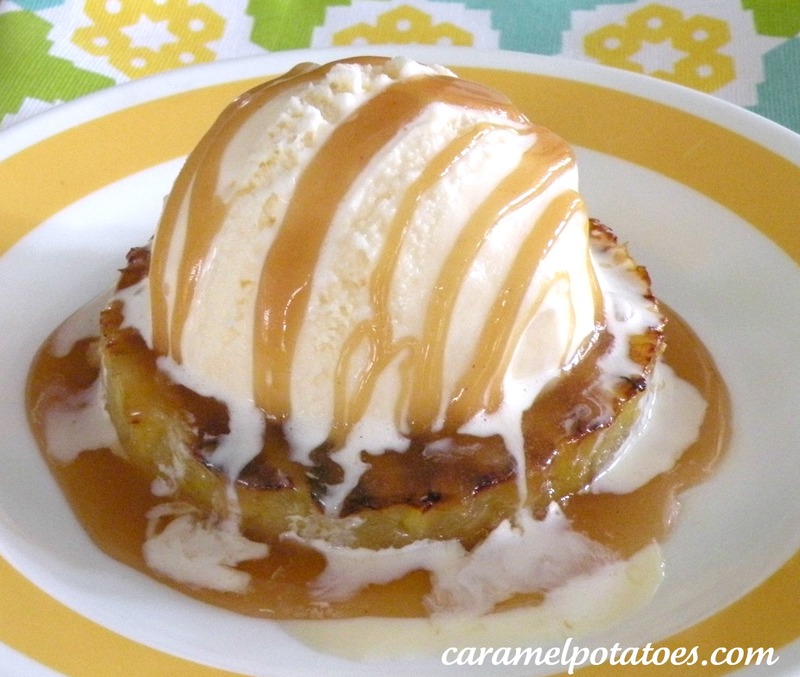 . . Grilled Pineapple Sundaes!! It’s a menu everyone is sure to love! Grill pineapple rings. On outdoor grill cook each side 2-3 minutes or until golden brown grill marks occur, or on indoor grill/panini press for about 3-4 minutes. For sauce mix together brown sugar, lemon juice, water and salt in small sauce pan. Cook on medium heat until the mixture starts to boil. Remove from heat and stir in butter until melted. Add in cream and stir until smooth. Serve immediately on sundaes. To assemble sundaes, place a scoop of ice cream on top of grilled pineapple and drizzle with warm brown sugar lime sauce. Note: You can make the sauce up ahead of time and refrigerate – just warm on low heat (don’t boil) and add an additional teaspoon of cream if needed. Enter our Breville Panini Press Giveaway Here! Look at you! You’ve been featured at The Kurtz Corner!! These look so tasty! Thanks for linking up! Come grab a featured button and don’t forget to check out your “Featured Pin” on my pinterest board! Grilled pineapple is one of my favorite things so I had to pin this to my “Mouthwatering” board. Found you on Saturday Dishes. Following you via Pinterest!